Cumin Essential Oil, Egypt has a history dating back to the earliest Mediterranean empires and is also known as "Roman Caraway." The aroma is powerful, spicy, green and fatty. Read on for some astonishing health benefits. The health benefits of Cumin Essential Oil can be attributed to its properties like bactericidal, carminative, digestive, diuretic, anti septic, anti spasmodic, detoxifier, emenagogue, stimulant, nervine and tonic. Essential Oils of Cumin is extracted from its dried and crushed seeds through steam distillation. Cumin is scientifically known as Cuminum Cyminum. Cumin is so popular, as a spice all over the world, that it does not need any introduction. But Cumin Essential Oil does. Nearly all the medicinal properties of Cumin come from its essential oils, which, in its pure form, is far more effective and beneficial than cumin seeds. The Cumin Essential oil is composed mainly of Cuminic Acid, Cymene, Dipentene, Limonene, Phellandrene and Pinene. It has astonishing medicinal properties and health benefits. * Bactericidal: It is a good bactericide. It can be used in treatment of diarrhea and cholera which are caused by bacteria. Further, it can cure internal bacterial infections like in colon, stomach, intestines and urinary tract as well as external infections on skin, ears, eyes and in wounds. * Carminative: Cumin Oil has strong carminative properties and efficiently drives away gases from intestines. It also prevents further formation of gases. * Digestive: Cumin Oil aids digestion (but should be taken in low doses, high doses can do just the reverse and can also make you vomit), promotes discharge of bile and gastric juices and also stimulates peristaltic motion of the intestines. Its smell acts as an appetizer. * Diuretic: Cumin Oil increases urination, both in frequency and in quantity. This may sound not that important but it can be very beneficial for health. With urine, fats are lost from the body to the extent of 4% of the volume of urine. So, it is obvious, the more you urinate, the more you lose fat. Then, urination promotes digestion and also does not let gas form. It removes excess water from the body and reduces swelling etc. Its biggest contribution is that it removes toxins from the body. What’s more, it also reduces blood pressure. That is the reason most of the drugs for lowering blood pressure induce frequent urination. Urination also helps clean kidneys. * Anti Septic: The anti septic properties of Cumin Oil do not let the external and internal cuts and wounds go septic. * Anti Spasmodic: This oil has very effective anti spasmodic properties. It can be used in treatment for nearly all sorts of spasms and associated troubles such as cramps, convulsions, non-stop coughs, pains and cramps. * Detoxifier: Cumin Oil is an efficient detoxifier. It removes toxins, including those which are produced by the body such as some excess hormones and metabolic by products as well as those which get into the blood stream through food, such as uric acid, insecticides, synthetic colors and fertilizers etc. It promotes sweating and urination, thereby removing the toxins through them. * Emenagogue: Cumin Oil can help maintain a regular menstruation cycle and can open obstructed menses. It also helps in recovery from Post Menopause Syndromes. * Stimulant: It particularly stimulates the digestive and the excretory system and keeps them in order. * Nervine: Cumin Oil is good on nerves and helps cure nervous disorders such as convulsions, anxiety, stress etc. * Tonic: Tones up muscles, tissues and skin as well as the various systems functioning inside the body, such as respiratory system, circulatory system, nervous system, digestive system and the excretory system. This tonic effect helps retain youth for a long. 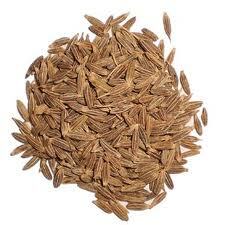 * Other Benefits: Cumin Essential oil can be used against colic, dyspepsia, flatulence and depression. Few Words of Caution: Cumin Oil shows photo toxicity when exposed to sunlight and hence should not be exposed to sunlight after external application. It should be used in low or mild doses because the very strong smell can cause headache and nausea. Pregnant ladies should avoid using this oil. Blending: Cumin essential oil blends well with essential oils of Angelica, Caraway, Chamomile and Coriander.